Over the strong objections of my girlfriend, who had asked me to stay at her house on the East Side to miss the traffic this weekend, I was headed for the abyss. What began on Thursday as idle musing—"what if I took on Carmageddon? "—had become my must-do bucket list quest by Sunday. The closure of a 10-mile stretch of the 405 Freeway, and "the mother of all gridlock" expected (Mayor Villaraigosa&apos;s words, not mine), held the promise of something I have missed since moving out to LA two years ago: an adventure. Sure, I have been in worse traffic. Heading east on the I-10 freeway during rush hour comes to mind. There was something about this, and the national media ruckus that ensued, that promised more than a traffic experience; I expected a life-changing journey. My girlfriend has begun to call me "nutcase." I had procrastinated all weekend, and by Sunday there were stirrings that the 405 could be opened anytime soon. News reports called the traffic so far timid. As I set out from San Gabriel, banana-nut muffin in hand, I worried I would miss the main event. This is the first time I have ever wanted to drive in gridlock. It felt weird. Smooth sailing through Pasadena, and a completely easy transition onto the 134 West. Nothing to report. I am already in Burbank and see my first sign for the 405 closure. I now know what Columbus must have felt crossing the Atlantic and seeing the first sign of land. I listen to the mayor’s news conference with dread. Fingers crossed, the freeway will still be closed in the next few minutes. I get on Sepulveda and head south. Luckily, the freeway will still be closed until at least 11:30. While the spirit takes me to keep going and see what the entrance to the 405 looks like, I choose safety over a big statement. I see the first police officer. I hope he doesn’t notice me taking a picture of him. The police presence is bigger than expected. Several officers on motorcycles stand guard at the entrance to the freeway from Sepulveda. I am moving too quickly (about sixty) to take pictures. A stretch limo drives up next to me. I wonder what celebrity or millionaire so wanted to be a part of this traffic event that he or she woke up early on a Sunday morning to make the drive. I decide that I will one day meet this rich idiot. I am surprised at the police presence along this stretch of Sepulveda, along with the absolute absence of cars. This is another reminder of the overblown response to what would be in any other town across this country a routine freeway closure. We love our cars so much here it scares people. A surprise. An officer waves our convey of four or five cars onto the 405 South. For the first time since moving to LA, I have the freeway to myself. I turn off the radio and take a few deep breaths. 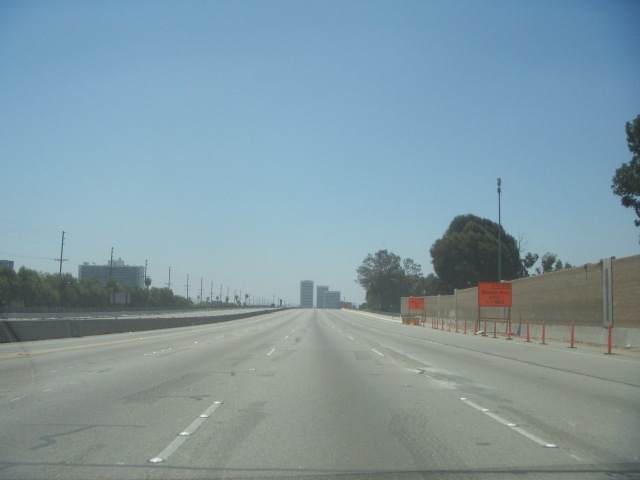 Looking out toward West Los Angeles and the ocean, I feel at peace—the great promise of this land, and its beauty beckon, as if completely unoccupied; this freeway constructed only for me. There are no assholes in BMWs honking at me to move out of their lane, no one is on their cell phone swerving dangerously close to my car, it is only me taking my time on a coastal road. I am in Westwood. The drive was so great I consider going back the other way. Yet I know already that the freeway is opening. I would have no chance—anyway, there’s probably traffic.